So last night was the Halloween Episode of DFWWW (Dallas-Fort Worth Writer’s Workshop). We had an awesome potlock and also celebrated the fact that the workshop has produced 300 published novels. Readings for that night were separated by Halloween reads and “regular” reads. So…I signed up for a regular read. I figured the first time I read my stuff in front of strangers was pretty damn scary and fit into the seasonal theme. I’ve taken the feedback I got from the critique group, made some adjustments to “Gauntlet”, and have cast it into the “Hope and Rejection 2010” tour of story submissions. Speaking of that, I received a very encouraging rejection on another story in the submissions column . Essentially, the editor assured me that it was a well-written story and had even made it out of the slush pile and into the “second opinions” file, but in the end it was rejected based on the individual taste of the editor. If all my rejections were like that I’d be pretty happy…though more happy with an acceptance, of course. So, once again, that tale goes back into the tour in hopes of finding an outlet. Right now, I’m in a pretty satisfied place as a writer, which is actually kind of rare and special for me. 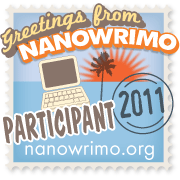 But enough navel gazing…I’m way behind on my prep for NaNoWriMo this year. It’s coming up in less than a week, so I better get cracking! This entry was posted in Ramblings and tagged critique, dfw writer's workshop, dfwww, nanowrimo, rejection, short stories, writing. Bookmark the permalink.